Historic Centre of Guimarães and Couros Zone (extension) is part of the Tentative list of Portugal in order to qualify for inclusion in the World Heritage List. The former tannery quarter of Guimarães, the Zona de Couros, has been listed on the T-list as an extension of the existing WHS in 2017. 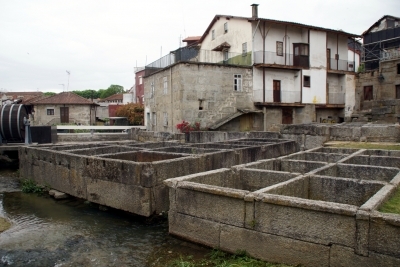 In the tourist map of Guimarães, the Couros zone is marked as a small area south of the historic centre. Several tanning basins have been preserved (photo) and some of the historic factory buildings have been renovated and are reused for offices or similar purposes. Other buildings are still waiting for renovation. But much of the area is not accessible to visitors and there is no information or explanatory boards on the significance of the site. Moreover, I have doubts that this Couros zone would contribute to the outstanding value of the WHS Guimarães. Therefore, I think that an extension of the Guimarães WHS is rather unlikely.